Our Ferry 5 arm rotomolder can handle 1-10 spiders for large to small volume items. Each spider can be up to 90 inches and hold numerous tools depending on size of the part, the more tools the lower the cost which makes roto molding a good fit for low-mid volume items. LLDPE (Linear Low Density Polyethylene) is most common plastic but other plastics can be used to suit your specific need. 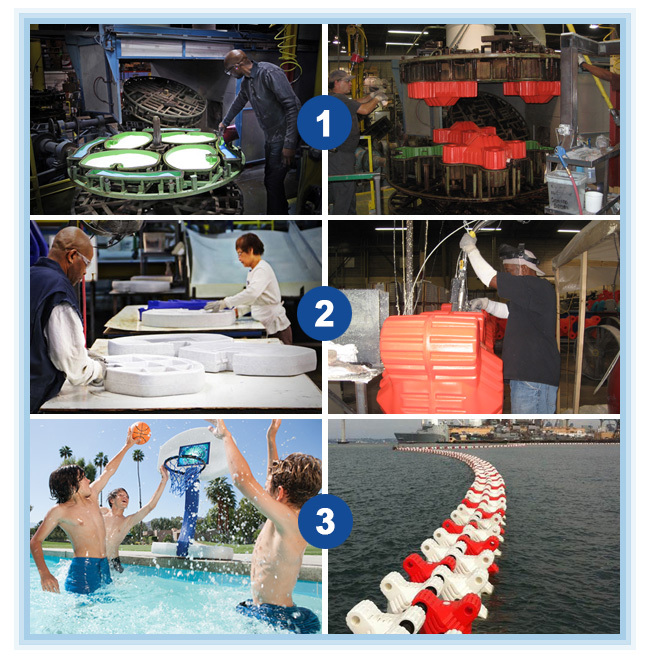 Swimways Corporation has over 20 years experience shipping to the largest retailers in the world – over 6,000 accounts serviced large and small. With our proximity to the Port of Norfolk, our operation is an excellent choice for your custom plastic needs. We have long-term relationships with tool makers and our industrial designers are on-site to help put your dreams on paper. We also have packaging designers, graphic artists, and a full staff of manufacturing professionals at your disposal. We have sub-assembly / kitting / pack-out capability with labor to handle downstream operations, custom packaging and labeling to suit your needs along with a fully staffed quality assurance team on site. Our in house maintenance team minimizes downtime, preventative maintenance programs are in place and a new computer module provides increased efficiency. Please contact sales@swimways.com for more information.